The recent Weekly Genealogist survey about musicians in the family sparked interest from readers, which leads me to share my great-great-grandfather’s story. 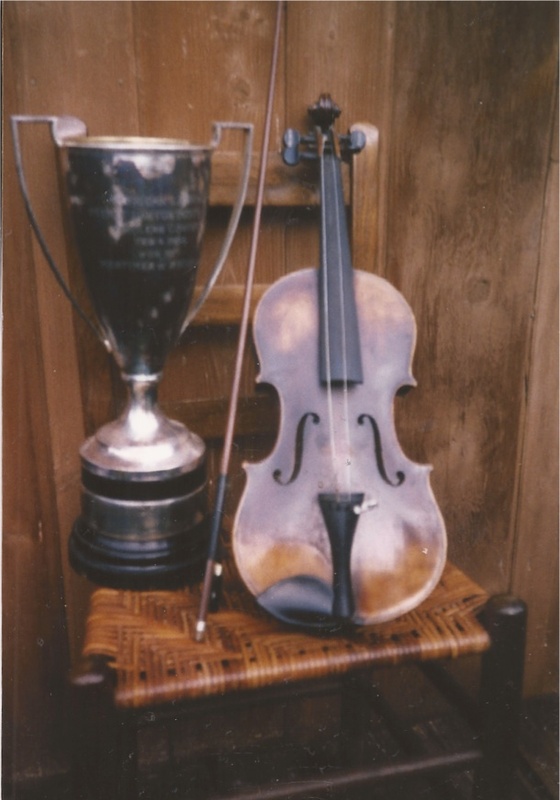 Two of my mother’s most treasured family possessions are the violin of her great-grandfather Mortimer W. Brooks (1847–1931) and the loving cup he won in 1926. Undoubtedly they are more treasured because she actually knew him and had the opportunity to hear him play. Mortimer Brooks died when my mother was about 4½ years old. As she describes it, he would first pull the piano stool to the middle of the room, face the piano, and then ask her what she wanted him to play. She always asked for Pop goes the Weasel and he was happy to oblige. The loving cup my mother has is the one that he won at the “Old Time Fiddlers’ Contest” held at the Armory in Bellows Falls, Vermont, on the evening of 4 February 1926. According to the local newspaper, about 10 inches of snow fell that day, but it did not keep the crowd of 800 or more people away. There were eight contestants from Vermont and New Hampshire. The previous year’s winner’s presence generated lots of attention, even though he did not compete. He was John Wilder, President Calvin Coolidge’s uncle. Each contestant played three tunes, one required of all and two personal favorites. Mortimer played Turkey in the Straw, Green Fields of America, and Pop Goes the Weasel. Mortimer Wilson Brooks was born in Warwick, Quebec, in 1847 to Thomas and Fanny (Doyen) Brooks. Family lore has it that he ran away to Concord, New Hampshire, so that he could enlist in the Civil War, but that his older sister Rebecca intervened. Mortimer clearly returned to Quebec, where he married and raised his five children. About 1879 or so the family left Quebec for New Hampshire and later Vermont. Mortimer was a carpenter. The family lived a rather itinerant life between their own farm and the homes of his children in New Hampshire and Vermont. He died 30 April 1931, and is buried in Saxton’s River, Vermont. According to one of his nieces, who shared news of his victory with the Fitchburg Sentinel, Mortimer was not the only fiddler in the family. Her father and three other uncles also played the fiddle. The violin Mortimer played was said to have been about 150 years old in 1926. It sits in its original wooden case with a green felt lining and even an old block of rosin. My 2nd Great Grandfather, James Judson Peek, and four other men from around Mendon, Michigan got together and travelled to the California Gold Rush in 1850. They went to New York to board a Steamer that carried them to Panama. There was no canal then and so they walked overland across the isthmus to the Pacific coast where they boarded another steamer which carried them to San Francisco, California and on to the gold fields. 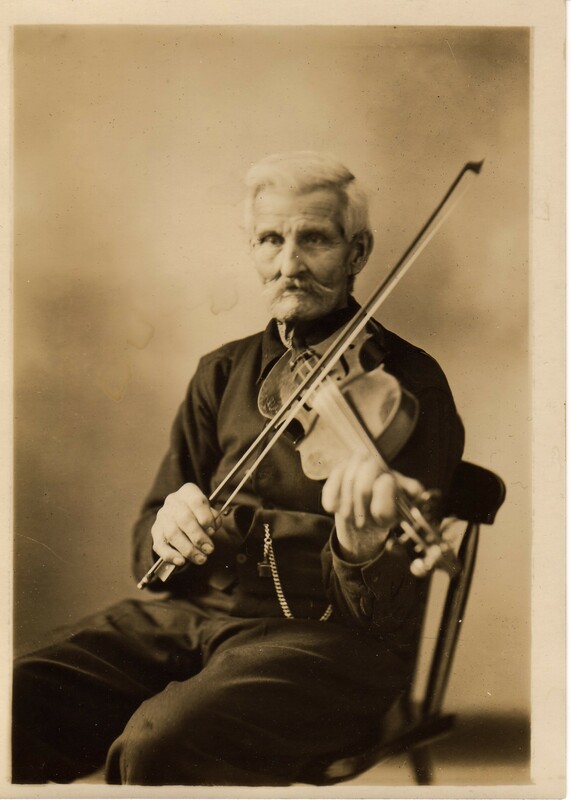 They did have some small success finding gold, but James Judson made more money playing his fiddle for the other prospectors and dance hall parties. He returned to Mendon a year and a half later with enough money to buy his farm. The casualty of this was his marriage to his 2nd wife who divorced him while he was gone. He married his cousin Sally Ann Peek who was a widow and they went on to have two children, one being my Great Grandfather, Nelson George Peek who was born in 1862. This line of Peek’s extends back to New Amsterdam, New Netherlands, and Jan Peeck, the namesake for Peekskill NY. Thanks for the post. Since I live in Rockingham, VT I went to the library to read the account of Mortimer’s performance that was published in the Bellows Falls Times, and then over to Saxtons River to see his gravestone. I was particularly impressed that so many people would go out in a snowstorm to see the contest.